Belltech Accessories - Dezod Motorsports Inc - Home of the automotive performance enthusiast since 2002. From engineered foam bump stops to shock extensions Belltech has everything you need when you want those extra accessories for your project vehicle. 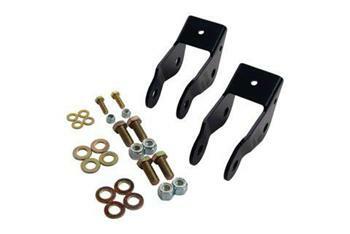 Belltech alignment kits provide you the solution for all of your alignment needs. If more adjustment for proper rear driveline angles is required, our pinion shims are your solution. Belltech Bumpstops are designed to compliment any suspension lowering kit. The urethane bumpstops provide a pad to stop suspension travel in case of a severe overload. All our bumpstops come with threaded studs for easy bolt-in installation. Belltech crossmembers are designed to exceed OEM load specifications and are direct replacement of the factory unit. Again of 2.25” of clearance is achieved using the Belltech crossmember. Belltech’s low profile design reduces the risk of bottoming on extremely lowered trucks. In many cases when lowering your vehicle the travel of your suspension is reduced, resulting in the need for a shock absorber designed to work with shorter travel, such as our Nitro Drop 2 or Street Performance Shocks. However, if you are satisfied with the ride of your vehicle, but want than lowered stance, then Belltech Shock Extensions are the answer. Designed to relocate the lower shock mounting point to allow the factory length shock to retain its travel and installation angle, our Shock Extensions are constructed of heavy duty stamped steel and are powder coated for a long lasting finish.